No, but it’s such a mess here, it’ll turn out one day after I buy a replacement. In fact if I want to find it sooner, I should buy one now. Now I want surf & turf. Too bad it is 7am. I have eaten steak at 7 am before. not lobster though…. I want surf & turf too! I’ll have to go to a restaurant I know does it well next time I’m in the States. I do sympathize with Jen, I don’t have epilepsy but flash photography does make me blink much to the frustration of photographers. I hope you can find that flash drive, there is some great albums and memories on it. 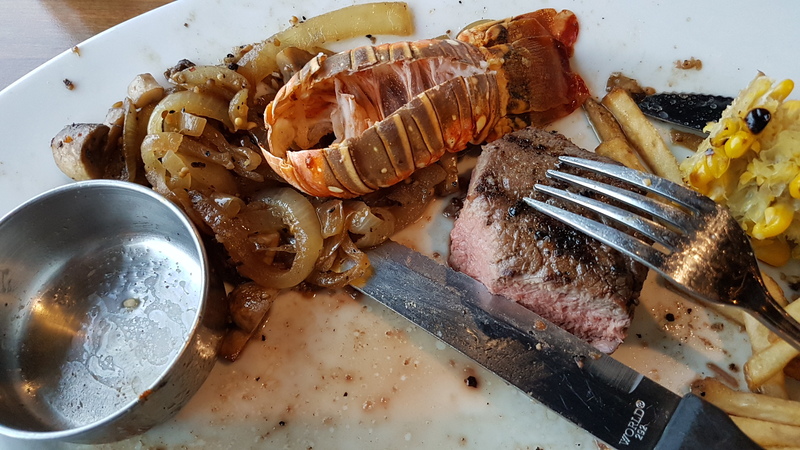 Come here for $20 surf and turf, and help me find that damned flash drive! Too late I finally found it! Oh well, good job you found it. Still no luck! Might have to buy a new flash drive in 2019. Peart packs it in and Mikey loses his flash drive..End this week now man! It’s Friday dude! Early end of the day for me, early start to the holidays. Dude did you ever find that drive??? FOUND IT YESTERDAY! It was behind the drier sheets! It was laundry day when I lost it. Then immediately after finding it, I dropped it on my way out to the car and lost it again! I finally found it later that day, it had slid under the closet door! But now it is safely plugged in again. Man we gotta get you a lanyard for that thing. Wear it around your neck! Rush and AC/DC? Yeah, we can hang. I knew that was gonna happen. One day hopefully.